“Mom, I think I have a fever,” was the sure fire way to stay home from school as a young child. One such instance, my mom put her hand to my forehead and told me to go get ready for school. I walked away wondering how she could possibly know I didn’t have a fever without using a thermometer. I decided it could only be one thing: special mom powers. Parents and doctors have used fevers to monitor infection for decades; no special mom powers after all. Before the discovery of antibiotics, doctors used high fevers to treat various diseases and medical conditions. Even today, increasing body temperature is a used to treat cancer, in combination with other treatment options. Despite fevers being used to treat infection and cancer for decades, it was only recently that doctors and scientists begun to understand how fever treatment works. A recent study by Lin and colleagues suggests fever may help immune cells, called T cells, find their way to the infected part of the body. T cells help fight off many different types of infections caused by bacteria, viruses, and fungi, collectively referred to as microbes. T cells are part of the adaptive immune system, meaning each T cell is trained to fight one specific invader. Therefore, during infection, the correct T cell (i.e. the one trained to fight that particular infection) needs to receive the message that there is an invader and then travel to the location of invader in the body. Adhesin molecules on blood vessels act as a Velcro hook, while integrins on T cells act as the Velcro loop. When you get an infection, your body quickly recognizes there is a foreign invader; a microbe that has lost its way and entered enemy territory (your body). Once an invader is identified, your cells begin making molecules to activate the body’s innate immune system to help fight the foreign invader. Some of these molecules can act like messages that travel all over the body to alert other cells of danger or travel to the brain to cause fever. Another subset of these molecules act as bread crumbs to lead immune cells to the infection battlefield or place where the invader was identified. The first to arrive on the battlefield are innate immune cells. Innate immune cells, in combination with other parts of the innate immune response such as fever, and mucus, use their broad arsenal to try to quickly disarm the foreign invader. However, the meanest of microbes can endure the hottest of fevers, escape the stickiest of mucus, and hinder the most brutal attacks by innate immune cells. In the event the innate immune system cannot fight off the invader, messengers are sent to find the right T cell for the fight. Once the T cell trained to fight the infection is called upon, the T cell travels through the bloodstream, the highway for immune cells during infection, following chemokine breadcrumbs to the infection battlefield. While traveling on the bloodstream highway, T cells put proteins called integrins on their surface – think of them as the loop part of Velcro (Image 2). 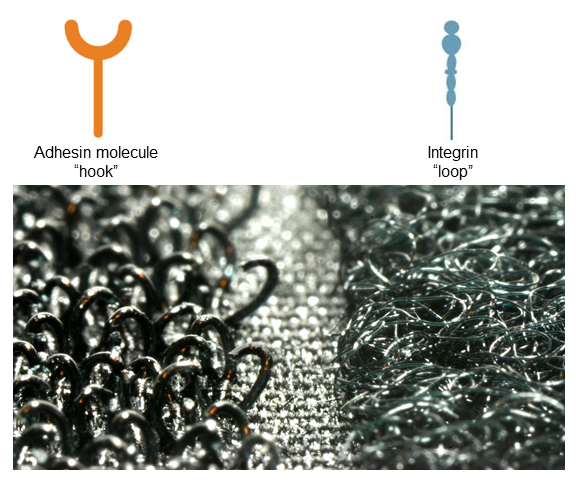 Cells that make up the wall of the blood vessel near the battlefield put proteins called adhesion molecules on their surface – these act as the hook part of Velcro. When the T cell is traveling past the battlefield, adhesion molecules on the blood vessel wall will bind the integrins and catch the T cells, like a Velcro tether. This ensures the T cells do not miss the battlefield location (Image 3). 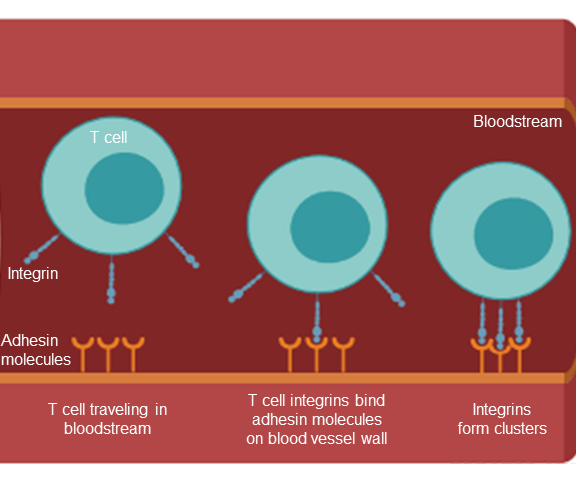 T cells traveling through the bloodstream are caught near the site of the infection by binding of T cell integrins to blood vessel adhesin molecules. Clustering of integrins strengthens the bond between the T cell and the blood vessel to ensure the T cell does not pass the infection location on its journey. Interestingly, fevers can help with this tethering process to get T cells to the right place at the right time. Fevers increase the number of adhesion molecules lining the blood vessel wall at the location of the infection. 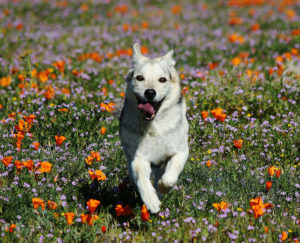 This increases the chance T cells will be “caught” as they travel through the bloodstream. The study by Lin and colleagues shows fevers increase the activity of integrins, making them extra sticky. 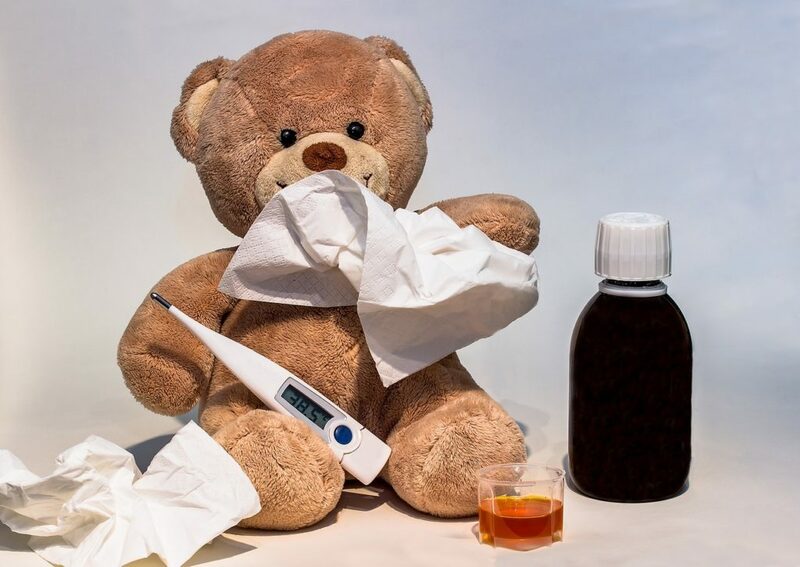 T cells sense the increased body temperature during fever and begin making more heat shock proteins, which are proteins that help protect cells from fevers. It turns out heat shock proteins also bring integrins together as clusters and clusters of integrins are stickier than a single integrin. 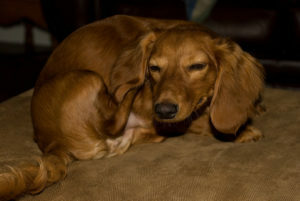 Going back to our Velcro analogy, imagine the hook side of the Velcro trying to grab onto one small piece of the loop. This bond is not going to be very strong. However, if the Velcro hooks attach to multiple small loop pieces, this bond will be much stronger. Further, clustering of integrins on the cell surface acts as an blinking exit sign on the bloodstream highway, signaling to the T cell to leave the bloodstream, by going through the blood vessel wall, to get to the infection battlefield. Once on the other side of the blood vessel, the T cell can begin to fight the microbial intruder. Fevers are often thought of as a simple consequence of illness without much thought to their actual purpose. However, the studies of Lin and others show inducing fever is an important and intentional process carried out by the body to improve the immune system’s ability to fight infection. We will never know what a human immune system without fever looks like, but one thing is for certain, without warm foreheads there would be a lot more children at home watching cartoons. Peer edited by Laetitia Meyrueix and Samantha Stadmiller. Influenza is a virus that straddles two worlds: that of the past and that of the future. Responsible for more deaths than HIV/AIDS in the past century, the flu is one of the world’s’ most dangerous infectious diseases though it may not seem so, especially in the United States. However, the flu is responsible for millions of cases of severe illness and approximately 250,000 to 500,000 deaths worldwide each year. 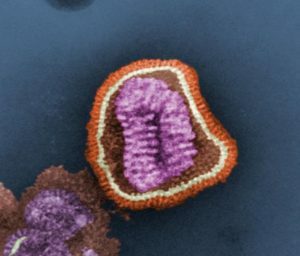 Influenza A and B circulate each flu season, but it is the emergence of new influenza A strains that have been responsible for worldwide epidemics, or pandemics, in the past such as the 1918 ‘Spanish Flu’ pandemic and the 2009 H1N1 pandemic. There are 2 ways a new influenza virus can emerge. Every time the virus replicates, small genetic changes occur that result in non-identical but similar flu viruses: this is called “antigenic drift”. If you get infected with a certain flu virus, or get a vaccine targeting a certain flu virus, your body develops antibodies to that virus. With accumulating changes, these antibodies won’t work against the new changed virus, and the person can be infected again. The other source of change is “antigenic shift”, which results in a virus with a different type of hemagglutinin and/or neuraminidase, such as H3N2 to H1N1. The 2009 H1N1 virus is cited by some as a result of antigenic shift, because the virus was so different than previous H1N1 subtypes; however, as there was no change in the actual hemagglutinin or neuraminidase proteins, it was technically a case of antigenic drift. 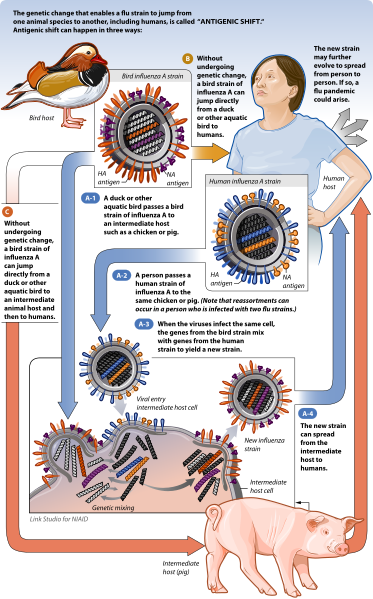 This diagram depicts how the human cases of swine-origin H3N2 Influenza virus resulted from the reassortment of two different Influenza viruses. The diagram shows three Influenza viruses placed side by side, with eight color-coded RNA segments inside of each virus. The virus from the 2009 pandemic (right) has HA/NA proteins and RNA from Eurasian and North American swine instead of from humans like in previous years (left two viruses). Content Provider: CDC/Douglas Jordan, M.A. 2011. Scientists and policymakers face many challenges when studying the influenza virus. For instance, the virus can be transmitted among people not showing symptoms and cough, sneeze, or handshake can spread infectious droplets from someone who doesn’t know they’re sick. 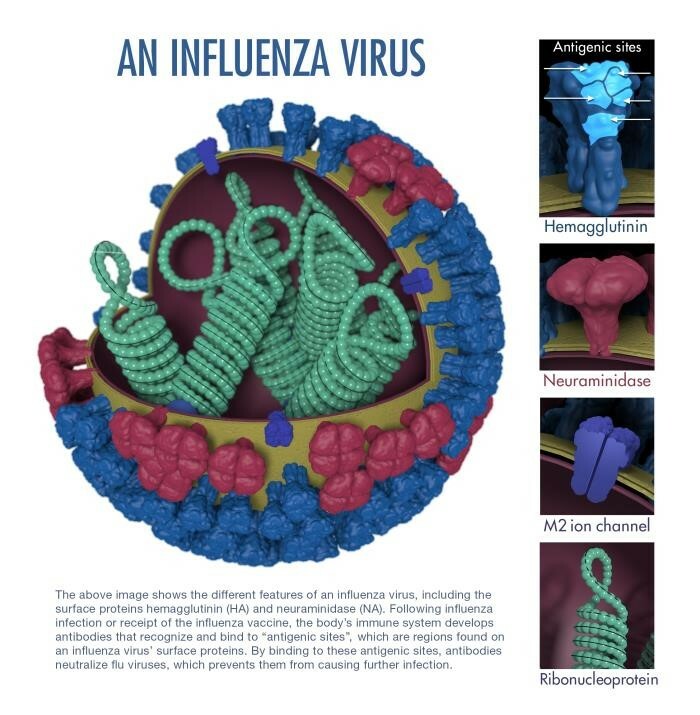 Scientific study is further complicated by the virus itself: there are 3 antigenic types of influenza virus that infect humans, (A, B, C), with various subtypes and strains. 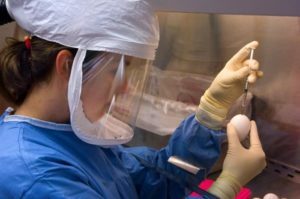 Each year, government agencies work with scientists to decide which strains to target in that year’s vaccine manufacturing. The lag time between production in the spring and the flu season in the winter provides time for unexpected types to emerge. This is a 3D illustration of a generic Influenza virion’s fine structure. The panel on the right identifies the virion’s surface protein constituents. Content Provider: CDC/ Douglas Jordan, Dr. Ruben Donis, Dr. James Stevens, Dr. Jerry Tokars, Influenza Division. 2014. Illustrator: Dan Higgins. The H#N# nomenclature for influenza A subtypes refers to the hemagglutinin (H) and neuraminidase (N) proteins that sit on the surface of the virus. There are 18 types of hemagglutinin and 11 types of neuraminidase. Hemagglutinin aids the virus in fusing with host cells and emptying the virus’ contents inside. Neuraminidase is an enzyme embedded in the virus membrane that facilitates newly synthesized viruses to be released from the host cells to spread the infection from one cell to another. 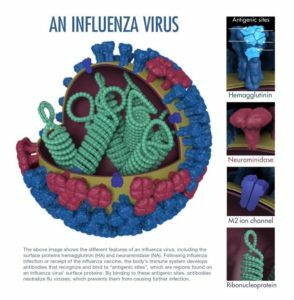 In studying ways to prevent and battle influenza, research scientists have focused their efforts on blocking the actions of neuraminidase and hemagglutinin. Antiviral drugs, such as oseltamivir (Tamiflu®) and zanamivir (Relenza®), bind neuraminidase, both interact with neuraminidase at sites crucial for its activity. The drugs act to render the virus incapable of self-propagating. A computational biologist at the University of Washington in Seattle, David Baker and his team know the hemagglutinin protein well. In 2011, they utilized nature’s design by studying antibodies that bind hemagglutinin in order to design a protein that targets the glycoprotein’s stem in H1 subtype flu viruses and prevent the virion from infecting the host cell. However, antiviral resistance contributed to by antigenic drift, is a serious issue. Researchers much constantly develop new drugs to keep up with changes in the virus. David Baker and his team now focus their research on the hemagglutinin protein. Utilizing a computational biology approach, they designed a protein that fits snugly into hemagglutinin’s binding sites. They tested their designer protein on 10 mice and found that in mice exposed to the H3N2 influenza virus, their protein worked both as a preventative measure and as a treatment. Though there is a long road to human testing, this binding protein shows promise for bedside influenza diagnosis as well as a model for possible treatments. This photograph depicts a microbiologist in what had been the Influenza Branch at the Centers for Disease Control and Prevention (CDC) while she was conducting an experiment. Content Provider: CDC/Taronna Maines. 2006. Photo Credit: Greg Knobloch. 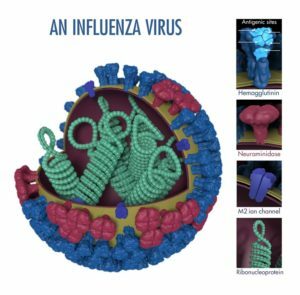 Learn how scientists monitor circulating influenza types and create new vaccines each year. See flu activity and surveillance efforts with the CDC’s FluView and vaccination trends for the United States using the FluVaxView. Peer edited by Richard Hodge and Tyler Farnsworth.